Location 450km from the river-side capital of Louetsi. Provides power for the south-west of the country. The Eranove group has partnered with Gabon's Strategic Investment Find (FGIS) in order to work towards the national aim of meeting all the country's water and electricity needs, devising a competitive, sustainable plan that would create jobs. The Eranove group has partnered with Gabon’s Strategic Investment Find (FGIS) in order to work towards the national aim of meeting all the country’s water and electricity needs, devising a competitive, sustainable plan that would create jobs. 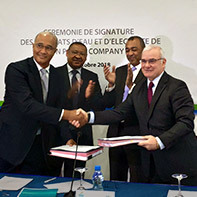 To this end, they signed the concession contract with the government in Gabon on 21st October 2016, for design, financing, construction and operation, and the electrical energy sales contracts on 26th October 2018, for the Louetsi Energy hydroelectric development (15 MW), a waterside hydroelectric plant, 450km from the river-side capital of Louetsi, to provide power for the south-west of the country, on the Dibwangui site. The Gabonese Strategic Investment Fund (FGIS) and the Pan-African industrial Group Eranove have signed, with the Government of the Gabonese Republic, a concession agreement for the production of drinking water and two power purchase contracts.